1. There will be a get-together to meet Mimi in Oceanside, CA on Thursday August 4, 2011. For more information call Lois Boncer, 760-438-3431 or email Lois@AardvarkToZebra.Com. 2. 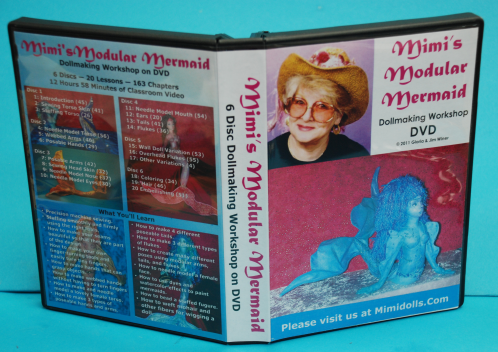 The sale on the Mermaids DVD set ends at the end of July. Order now to save $11.99 or 20%. 1. A single person must place the order, pay for the order, and receive the shipment. 2. Discount is about 50%. Pretty Faces is $20, Mermaids is $30. Plus you pay the postage on the box (usually under $20). 3. You must order a minimum of ten (10) copies, but you can mix Pretty Faces and Mermaids to make up the ten. There will be a get-together to meet Mimi in Oceanside, CA on Thursday August 4, 2011. For more information call Lois Boncer, 760-438-3431 or email Lois@AardvarkToZebra.Com. Turning Fingers for Cloth Dolls. 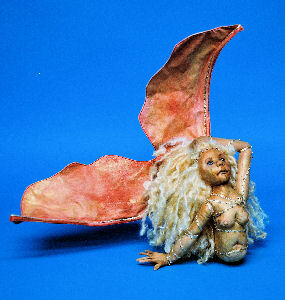 This new demo is chapters 3 and 4 of Lesson 6 Posable Hands from Mimi’s Modular Mermaid. It takes ten minutes and discusses making and using finger turning tools and turning fingers for cloth dolls. Making & Using Templates for Doll Patterns. 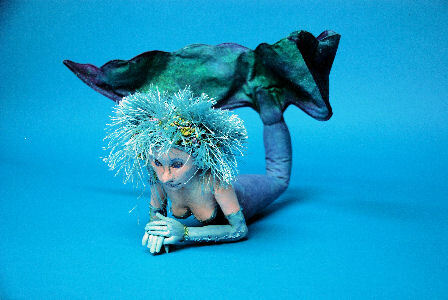 This new demo is chapters 4, 5, 6, and 7 of Lesson 1 Introduction from Mimi’s Modular Mermaid. It takes nine minutes and discusses making and using templates from pattern pieces and how this relates to precision sewing. We hope you enjoy it! To see the previous videos, click here (Intro and Wefting) and here (Sewing Machine). 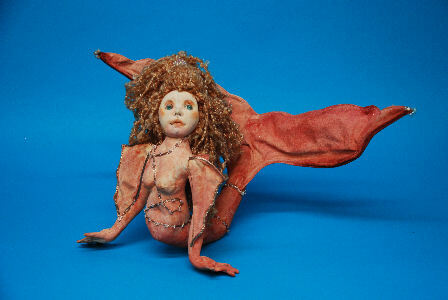 “The Screaming Mimis Workshop is a group dedicated to the dolls made by Gloria “Mimi” Winer’s patterns. The group members are currently working on the High Priestess, Drawing Down the Moon which is still being tested in classes around the country, and the free Mimi Pattern, An Elf Named Stretch which you can download from Mimidolls.com. 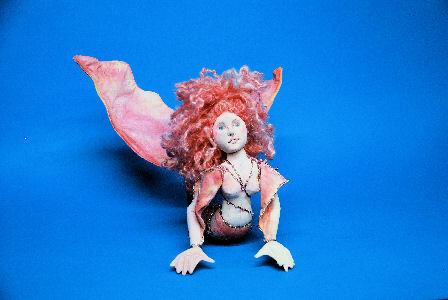 The Screaming Mimis Workshop will soon be adding Mimi’s Modular Mermaid and other Mimi patterns. and she will send you a personal invite. Using Your Sewing Machine for Dollmaking. This brand new demo is Chapter 13 of Lesson 1 Introduction from Mimi’s Modular Mermaid. It takes six minutes, discusses presser feet, cover plates, stitch size, needle visibility for precision sewing, and all of the other things you need to know to use your sewing machine more effectively for dollmaking. We hope you enjoy it! To see the previous videos, click here. 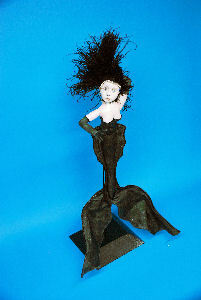 You can take a Private, 6-Day Dollmaking Workshop with Mimi! Mimi’s Modular Mermaid is here! Suitable for ALL Skill Levels! — 12 Hours 58 Minutes of Classroom Video! Your own copy is less than 1/6 the cost of a 3-day seminar! Much less when you include travel and hotel expenses! Groups, established by Sandra Bejster especially for folks making my dolls. Below are the new introduction video and the new Wefting Fibers Demonstration taken from Lesson 19. 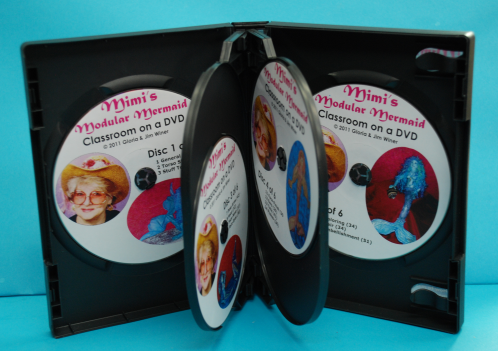 6-disc DVD set with 12 hours 58 minutes of over-the-shoulder classroom video. 20 Lessons with 163 easy-to-navigate chapters covering every aspect of mermaid construction. Electronic pattern sheet on the first DVD. Printed pattern sheet on lightweight paper optional. 1″ thick 6-disc DVD plastic case for storage. Filled with the complete contents of Mimi’s 6-day dollmaking workshop. Suitable for all levels. If you can do basic machine sewing to make the seams on the torso and tail, you will learn everything else you need from watching the step-by-step video. How to make your seams beautiful so that they are part of the design. How to make your own finger-turning tools and easily turn tiny fingers. How to make hands that can grasp objects. How to make webbed hands without having to turn fingers. How to make and needle model a lovely female torso. How to make 3 types of poseable hands and arms. How to make 4 different poseable tails. How to make 3 different types of flukes. How to create many different poses using modular arms, tails, and flukes. How to needle model a female face. 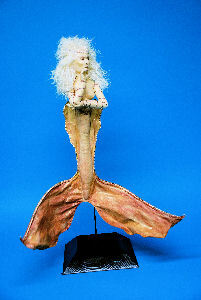 How to use dyes and watercolor effects to paint mermaids. How to bead a stuffed figure. 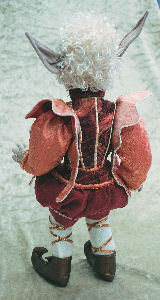 How to weft mohair and other fibers for wigging a doll. To order your copy at 20% discount ($47.96) until 7/31/2011, please visit Mimidolls.Com.